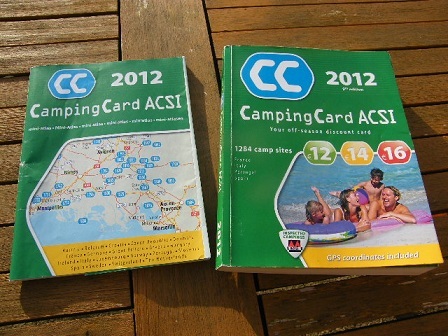 If you are planning to go camping with your own tent, caravan or motorhome in May, June, September or October then you should think about joining the CampingCard ACSI scheme. This scheme lists over 2000 campsites in 20 European countries which offer pitches in these low season months for between 12Euros - 16Euros a night (at time of writing this was about £11-£14). 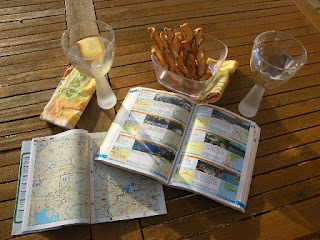 When you join up you receive a guide book listing the sites and a mini atlas. Although I must admit there are extensive site listings for French campsites but there are not terribly many listed for UK sites. Campsites are rated as either lively or relaxing etc. and average pitch sizes are given as well. So this could potentially be a great idea if you are planning to tour or are hoping to have a holiday on a tight or limited budget. You can also read reviews from other users on their website and add your own once you have stayed at a campsite. We at Best French Campsites offered a great new competition to help you start the New Year with a resolution to try something new and get into Camping ! Or if you are already a fan, you are sure to find something of interest at this fantastic show. We had three winners of our competition, including Mr Brooks, Mr Doran and Mr Y. who each won a pair of tickets to The Spring Caravan & Camping Show at the NEC, National Exhibition Centre, Birmingham in February. Well done to them and we hope you enjoy the show ! Let us know how you get on ! 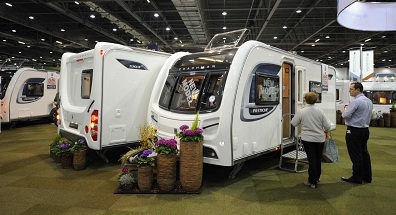 The Spring Caravan & Camping Show will welcome newcomers to camping, caravanning and motorhoming as well as existing enthusiasts looking to buy or browse all the latest 2013 models, leisure accessories, camping gear and to research new holiday destinations, attractions and service providers. The show will feature the latest in new season tents, caravans and motorhomes, which are ideal if you are planning to camp in France, Europe or the UK this year. The Show is supported by the industry's main manufacturers, brands and dealers, including ABI, Bailey, Coachman, Elddis, Lunar, Swift, Trigano, Auto-Trail, Chausson, Autosleepers, Willerby, Omar, Wessex Homes Group, Eterniti, Fifth Wheel, Carthago & Globecar, Frankia & Bavaria, Hobby, Rapido, Pilote, Vantage, Lowdhams, Chichester Caravans, Brownhills, Glossop Caravans, Raymond James and Wandahome South Cave to name but a few – full exhibitor list available on the Show website. Both The Camping and Caravanning Club and The Caravan Club will be attending the Show and entertaining visitors with new initiative launches, expert towing and motorhome manoeuvring tuition and celebrity guests. 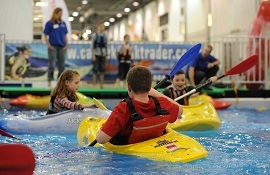 Newcomers to camping as well as families over the half term break will enjoy the four interactive feature areas which include a 'drop zone' climbing wall, campfire cookery, the UK's largest indoor kayaking pool, 'one to one with wildlife’ and 'rod and reel' angling pool. Each feature will benefit from a visit from a special celebrity guest throughout the Show week.